OMEGA 3 | iiaa Ltd | The UK and Ireland distributor of Environ Skincare, jane iredale makeup and Advanced Nutrition Programme. DOES NOT CONTAIN : sugar, salt, starch, wheat, gluten containing ingredients, maize, corn, yeast, lactose, dairy products, artificial preservatives, colours or flavourings. Take 1-3 capsules (children over 8 years, 1 capsule) a day, with meals, or as your health professional advises. Do not exceed recommended daily intake. A daily multivitamin is also recommended. Food supplements must not replace a varied diet and healthy lifestyle. 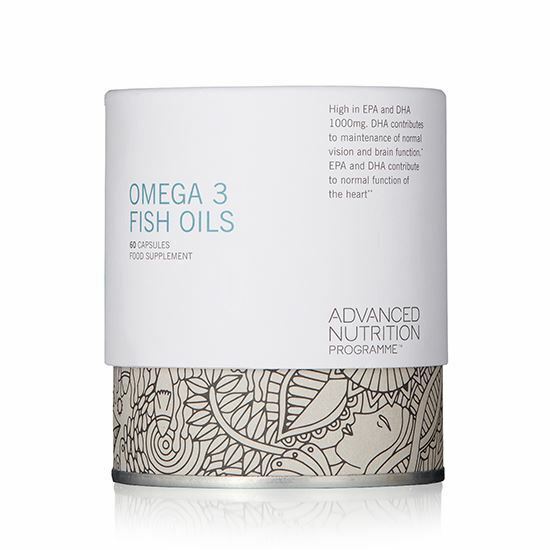 OMEGA 3 FISH OILS is a pure, unconcentrated, premier quality fish oil from sustainable sources, providing natural levels of the key omega 3 fatty acids, EPA and DHA, plus fish oil’s other natural components, including carotenoids and tocopherols, which work synergistically together. Keep out of reach of children. Store below 25ºC. Ensure pot is tightly sealed after opening and store in a cool, dry, steam-free environment as damp conditions can affect the product quality.